Sugar cane, rum and the sea create the basis for the economy and the culture of the charming island of Marie-Galante. It has, until recently, been almost undiscovered by tourism. 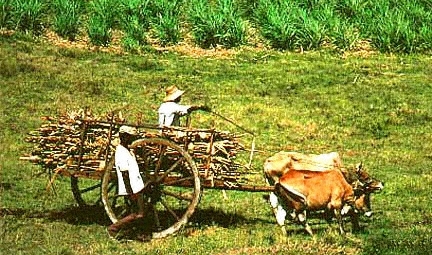 The social landscape of this primarily agrarian society mirrors that of Guadeloupe, with its roots in a mélange of European and African beginnings. Marie-Galante is one of the few places in the Caribbean where oxcarts can still be seen transporting sugarcane. March 21 - 24: CARIFTA GAMES 2008. Junior track and field championships open to athletes, age 13 to 19, from the Caribbean nations, members of the Caribbean Community (CARICOM). The games held in Guadeloupe in 2006 will be hosted for the first time by St. Kitts- Nevis. March 23 - 24: Easter Sunday and Monday, public holiday. Family picnics at beaches and rivers. Soccer games between Guadeloupe and Martinique are year's classic sports events. July 21: Schoelcher Day, public holiday, honors Victor Schoelcher and end to slavery in 1848. August 1 - 10: Tour de la Guadeloupe. 10 day International Cycle race, teams from many countries. 9 rough itineraries cover island in reduced version of celebrated Tour de France. Nov. 8 - 10: Triskell Cup Regatta. Mid-Nov: La Route du Rhum sail-boats are expected to start arriving in Pointe-à-Pitre. Nov. 22: Ste. Cécile. Music celebration in cities and towns.